A plan to visit TW's hometown was in the making ever since we got married in May. We did make a customary hurried visit, and had never been to head there all the time - some or the other thing happened every time we planned a journey. In the meantime, TW got employed and her office timings meant we couldn't plan a quick trip either. After going forth and back with the planning multiple times, we finally decide to travel during the extended weekend during Gandhi Jayanti. 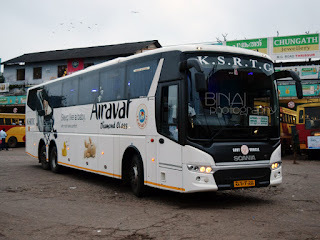 I wanted a bus that dropped us in Palakkad town for the outbound - this meant our options were limited to either KSRTCs. 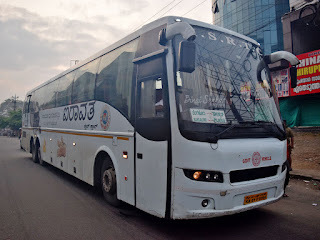 Karnataka SRTC was the call, since that was the only bus who's timings suited us. Like every time, I had a very busy day at office - reaching home well past 1800hrs. TW took a cab home, and she reached a little past 1830hrs. We quickly got fresh, and got moving by around 1930hrs or so - for a 2205hrs departure from Shantinagar. I briefly considered hiring a cab to the bus station - but GMaps warned that traffic was quite high, and cab availability was poor as well. In the meantime, a BMTC bus had arrived at the bus stop, which dropped us at the nearest metro station, 15 minutes later. We took the metro to Lalbagh from where an auto ferried us to Shantinagar bus station. We headed straight to A2B restaurant for our dinner before returning to the departure platforms. Our bus was no where in sight, although the time was 2145hrs already. I went around to hunt for our bus, and found the bus waiting in queue to enter the bus station! Boarding commenced only around 2200hrs - guaranteeing a delayed departure. The bus: KA-01-F-9354 after dropping us at Palakkad.. The departure queue system at the bus station overrides departure times, and any bus can depart only based on its sequence at the bus station - fortunately the bus ahead of us had a scheduled departure time before us - we were still delayed. Most of the bus was empty as we departed from the bus station, at 2224hrs - 19 minutes behind scheduled time. Traffic was on the lower side - we got to Dairy Circle by 2234hrs and to St. John's hospital by 2240hrs - just 16 minutes from Shantinagar! Boarding took quite a while here - the crew had to call up and find the whereabouts of a few of them - we finally got moving by 2244hrs. We got into some horrible traffic at Madiwala market (a usual scene off late). I was quite tired, and I slowly drifted asleep as we crawled through traffic below the elevated highway towards Electronic City. We had a pick-up at Electronic city (2317hrs) - I was fast asleep soon later. I slept quite well, and woke only as the bus pulled in to Hotel Saravana Bhavan Classic, near Krishnagiri (0022hrs) - it quite beats me as to why should a bus departing so late stop for dinner! I was groggy and only half-conscious as I walked around to use the restrooms, and then wait for the crew to return. We started off at 0038hrs from the hotel. I think it would be better to have a halt later, may be around day break, for people to use the rest rooms, at some toll gate, instead of stopping for dinner, and wasting time. I slept quite well - not continuously though. 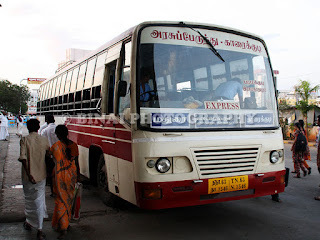 I woke up as the lights were turned on, on arriving at Coimbatore (0517hrs) - the bus had gone into the town, and had stopped opposite the bus station at Gandhipuram. The halt was short - passengers alighted quickly and we got moving. I slept even before we left Gandhipuram! I woke up only as the bus turned off the highway, to enter Palakkad town. 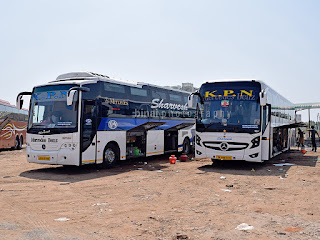 The bus stopped outside Palakkad fort to drop passengers (0619hrs), and then terminated the trip outside the KSRTC bus station, at 0621hrs - about 36 minutes behind schedule. Remarks: The bus, KA-01-F-9354, homed at Bengaluru-4 depot had clocked a little over 11 Lakh kilometres. The vehicle was very well maintained - couldn't hear rattles from the suspension set up. Quite unusually, the driver didn't lug the engine - he wasn't very fast, but was fast enough. Perfect gear changes was literally an icing on the cake. Both the crew members were very soft spoken, and well behaved. The service was completely no-nonsense - perfectly did the job of taking passengers from point A to point B. The dinner break seemed very unnecessary - maybe a quick break at a toll gate would've sufficed. Overall, a very good journey.